Renting a boat in Alabama is one of the best ways to explore the lesser seen areas of the state. There are plenty of lakes, rivers, and inlets throughout the state that will take you among local wildlife and let you see the state in a whole new way. Whether you love watersports or just want to spend a day relaxing on the water, you’ll want to start your journey at one of these 10 best places to rent a boat in Alabama. This full-service boating company offers so much more than rentals and will easily become your number one go-to every time you’re at the beach. Fun for the whole family, they have an impressive suite of boats of various sizes, including party barges with slides to get the most from your time on the water. In addition, they also offer professional charters and day excursions (go for the pirate cruise!) for those who aren’t ready to take the helm for themselves. A popular spot for bass fishing, Lake Purdy’s boat rentals help you get on the water so you can catch your share. They’re a full service rental agency for pontoon boats, kayaks, and stand up paddle boards. So no matter how you like to spend your day at the lake, there’s a watercraft waiting here for you. A popular locale among locals and travelers, this is one of the best places in the area for family jet ski tours and fishing charters. Boat rentals are outfitted with everything you need for a day on the water and are available for half or full day enjoyment. You can also book a jet ski and travel to some of the area’s hidden wonders, like Ono Island and Perdido Pass. Known for its fishing opportunities and laid back scenery, Lucy’s Branch is the ideal locale for those seeking a little peace and quiet on the water. The marina offers several pontoons boats for rent along with all the water toys to make your day special. They also have a stationary barge that’s perfect for parties and events. Grab your boat or jet ski, then set your sights on adventure! Even if you’re not an experienced captain, the folks here will show you everything you need to know about driving a boat to get you out on the water. They’ve also got the inside scoop on where to fish or see local wildlife. Offering a full fleet of boats and lake toys, the folks here put you on the water in the best possible ways. This lake is one of the most scenic in the state, so there’s no shortage of places to explore. Folks love renting here because of the personalized service, well-maintained boats, and how easy they make it to rent a boat. 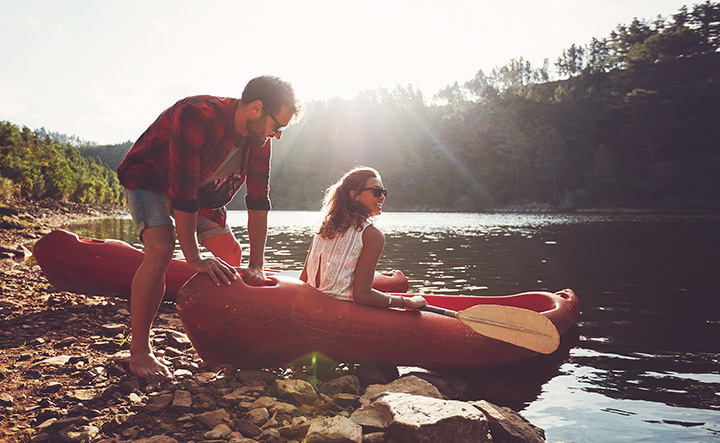 For a more rustic, laid back boating experience, there’s nothing like renting a canoe or kayak from Terrapin Outdoor Center. Located right on Terrapin Creek, the site offers shuttle service so you can spend your day floating on the river without investing in your own watercraft. Rentals can sell out quickly, so booking ahead is preferable. Equal parts boat dealer and rental hub, you can take your pick of several pontoon or deck boats to fuel your fun in the sun. They also carry gear like tubes and skis to complete the experience. They offer daily, multi day, and weekly rates for most of their watercrafts, so you can extend your boating adventure. Their pontoon boat rentals let you hit the water in style, offering large canopies for shade and plenty of storage. They offer a variety of rates to suit your trip and budget, from half a day up to five days or longer. They’re also a popular spot for fishing charters. Get a boat and a heaping helping of southern hospitality all in the same place. Fans love coming here because of the service and how easy they make it to rent a boat. They also provide pick up and delivery services, so you can explore the areas you want without having to head to a specific marina first.